Ce nouveau front de mer Villas Seabrook, qui dormir 1-14 adultes dans des lits et ont une mezzanine pour les enfants, sont tout juste de terminer. Chaque villa dispose d'une à six chambres qui peuvent être louées séparément ou tous ensemble et jusqu'à cinq salles de bains. Le décor des Caraïbes transporte le fantastique vie en plein air et le pont du parti a une vue du centre-ville au milieu du lac Pontchartrain. Belles finitions de bois et des appareils en acier inoxydable et des comptoirs en granit ajoutent au luxe. Une villa pleine dispose de 4 lits king size, 1 lit queen et 2 lits jumeaux et un lit queen size canapé-lit. Salon de jardin, plus un barbecue en plein air avec une vue panoramique ajoutent à l'expérience divertissante au Pontchartrain Landing. Profitez de notre station fermée avec une piscine, un bain à remous, rampe de lancement, navette pour le quartier français et les événements principaux, restaurant et bar avec musique live. Planifiez votre événement en utilisant notre nouvelle salle de conférence et grand restaurant. Nous sommes idéal pour les réunions, les mariages et les réunions de groupes jusqu'à 250 personnes. Nous pouvons faire de la restauration et faire de votre événement parfait. Nous pouvons accueillir des rassemblements jusqu'à 200 personnes dans notre nouvelle salle de réception et un restaurant. Prenez notre navette pour le quartier français et de laisser le volant à nous. Lovely place for a group! We stayed here for a Bachelorette party with 14 girls and it was everything we could have asked for. It's even better than the pictures described! We had a house in the way back which was nice for privacy. Each room as it's own or shared bathroom but it was perfect for our large group. Driving in was a little scary at first just because it's in an industrial area, but once you get to the park/RV entrance it's very safe and secure with a locked gate at nights. We would definitely stay here again! The shuttle to and from the French Quarter was clutch. Thank you!! We had a large group and rented all of the rooms. 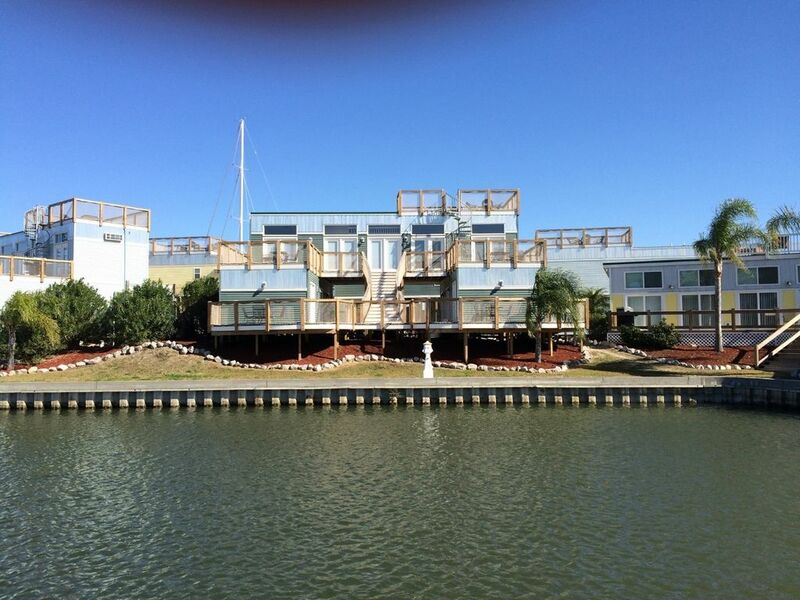 The property was very nice with lots of balcony and rooftop space and nice views of the waterways. We were able to all hang out together in the kitchen/living room area. The atmosphere around the whole RV Park/houses was very peaceful and we felt safe, even though our Uber drivers said we were in the the middle of nowhere. Would definitely recommend and would stay again in the future. The upper king bed was awful - like it was a wave - and most of my family reported the same. All 12 of our backs hurt and most folks were under 30. The sheets and pillows and towels are deplorably scratchy, the AC did not work in the kitchen. So, cooking was out of the question. No one responded to my email about the unit not working until after we had checked out. NOT HELPful. The bathroom in the upper king unit was so small you could barely move around. There were spiders everywhere, even the kitchen cabinets. I was afraid to turn the fan on in the upper king because an awful dusty smell was emitted, my eyes started watering, so I turned it off. The light comes glaring into the upper king room early due to the sky lights that cant be closed, adding to the heat. We had a 2 year old and the loft ladder was unsafe and you could not block it off. There was literally a plastic cafeteria trey screwed on the ground at the beginning of the hall to the bedrooms, near the front door that we repeatedly stubbed our toes on. The upper deck was soggy and felt unsafe, the thin and frayed rope railing was so scary, I don't even see how that passes any sort of code. It would not pass in Texas. I was nervous our two year old would fall through if she got too close. The view was nice, the pool was nice. If we had been camping and this cost a quarter of this rate we paid per night instead of it being the most I have ever paid per night, than this might have been worth it. But for the price, I would not recommend this place for anyone. PS. you should bring your own bedding and towels because theirs are awful. I find it unfortunate that you posted a review like this. Just to be clear and factual I want to clarify several things you have referenced. First, the beds. The most common request we have from guests leaving the property is asking for the brand of mattress as they claim it was the most comfortable mattress they have ever slept on. I wish I was making that up but I'm not. Second, the AC and towels. You were on resort property that is staffed 24hrs, but per our conversation after you left, you didn't notify anyone here of the issue. Instead, you sent an email to VRBO which wasn't relayed back to us until you'd already left. We discussed this by phone so once again I am at a loss as to why you would post a misleading review. As for the railings, they exceed Louisiana code. I'm not sure how they hold up to Texas code, but as we are located in Louisiana that is the code I need to worry about. You are correct that the ladder to the loft is not closed off, much like the ladder to a bunk bed wouldn't be either. We do not child proof these units as it would be impossible, instead we count on our guests to be responsible adults, and if children are staying we expect parents to be parents. I'm glad you liked the view and the pool. Lastly, the plastic "tray" you are referring to is also called a shoe pan. It's located by the door so you can take off your shoes and place them in it to avoid tracking anything throughout the unit. Using it is optional, it's there for the comfort of our guests. You seem set on attacking this property online, but were completely different on the phone. Once again had you simply addressed any one of your concerns to our staff on property it would have been addressed immediately. It would appear that this is your preferred method of communication however. The rooms were nice and the staff was super helpful. Not that far from the city. I'd recommend for large groups! The location was convenient to the French Quarter, City Park, and the Audubon Zoo. It is in a quiet location away from the hustle and bustle of city life. The lower level of the Villa is not quiet, however, if people have rented the floor above you. The staff were pleasant to work with. The Villa was clean and adequate for our purposes but there is really no comfortable seating: just a small table and 4 kitchen chairs. Would stay there again if nothing else in that price range were available. Nouvelle-Orléans est une ville fascinante avec beaucoup de nourriture et la musique. Les attractions sont nombreuses et il ya quelque chose pour tous les goûts. Du Musée II Guerre mondiale, galeries d'art, le vaudou, marais, et visites de la ville. Profitez de zoo ou un aquarium top rated. Faites un tour sur le Natchez, une de quatre des plus anciens bateaux à vapeur de fonctionnement aux États-Unis. Personne ne peut pas profiter de la variété de choses à faire. The Seabrrok Villa rates vary according to the number of bedrooms you want and day of the week. For instance, a 1 bedroom can be rented during normal season from $125.00 to $145.00 per night. The entire villa with 6 bedrooms and 5 bathrooms may be rented during normal season from $695.00 to $745.00 per night. Each entire villa sleeps 14 adults in beds and has a sleeping loft for children.